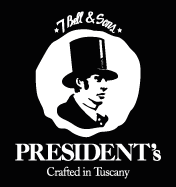 Not far from Milan, right after crossing the Italian border and entering Switzerland, you can find Bellinzona, a city situated in the Canton Ticino. Nested between lakes and mountains, this small city is worth visiting for its three main architectural projects which have transformed its public face and brought a new approach to revitalization of historical architecture and the fusion of buildings with the natural environment. Built on a hill, the oldest of three castles in Bellinzona, Castelgrande was mentioned in 590 by Gregor von Tours as “Castrum”. Between 1486 and 1489 the Sforza family from Milan extended the castle in order to repel the Swiss advancing from the north. Castelgrande has been restored between 1982 and 1992 and can nowadays be reached by an elevator from the city’s Piazza del Sole. Aurelio Galfetti, the architect in charge of the most recent restoration, combined modern architecture with a sense of Medieval pride, in order to create an “Acropolis of Light”. 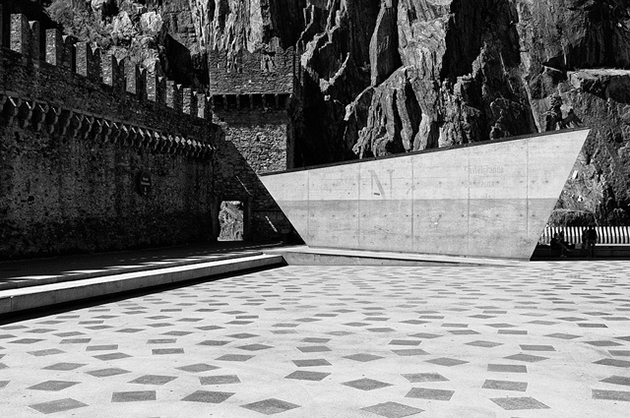 Aurelio Galfetti is one of the leading architects of Ticino’s local scene, and his transformation of the ruined remains of the Castelgrande in Bellinzona into a contemporary museum and culture centre provides us with a provisional resume for decades of architectural work. While Galfetti proposed a series of typological corrections to Bellinzona’s diffused townscape, he was also concerned in sharpening the public awareness of the genius loci and the town’s history, as well as with its future, of which the rebuilding of Castelgrande was a central point. 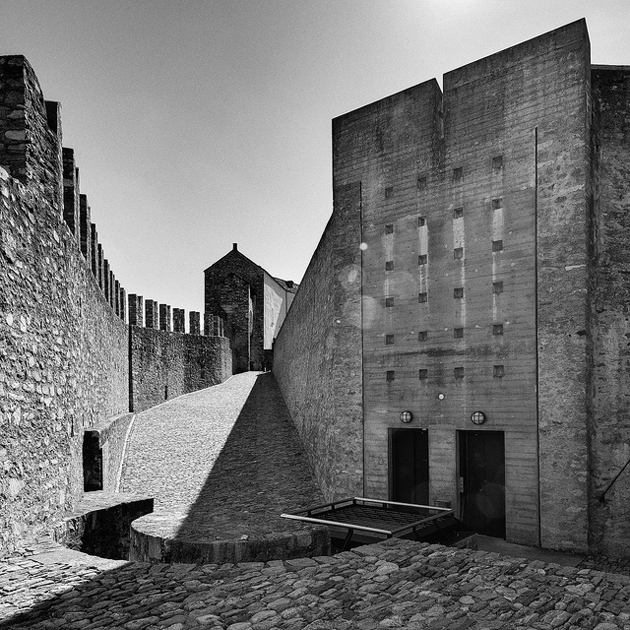 Galfetti’s effort produced one of the most significant conversion projects since Carlo Scarpa’s legendary work on Castelvecchio in Verona. 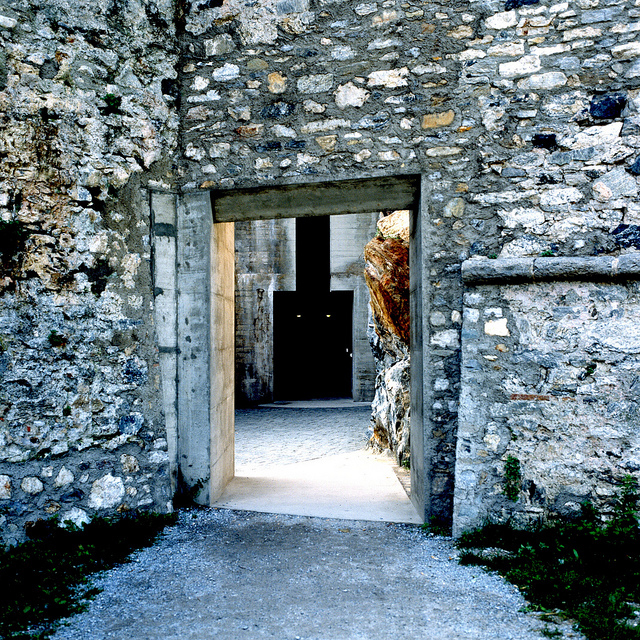 Galfetti had neither restored nor conserved Bellinzona’s ‘Acropolis’. At the most – as Neapolitan architect Francesco Venezia would say – he joined together pieces that form spaces in which light, objects and landscape carry a silent communication. He was concerned in the first place with transforming an extraordinarily damaged historical situation into an analogue reality that would be able to speak for itself again. The Square of the Sun, also known as Piazza Porta Ticinese, was built only in the XVIII century. The buildings that have marked the square were progressively removed starting from the 50s: the so-called island placed in the middle of the square was demolished first, then the houses close to the rock, and finally those constructions that concealed the city’s medieval walls. 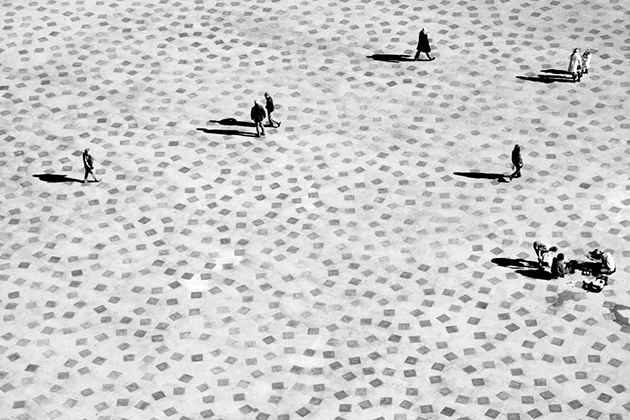 Today, Piazza del Sole can be viewed in its restored design carried out by architect Livio Vacchini. The linearity of the design, simplicity of access shafts and ventilation of the car park under the square, the dialogue instilled between the new architectural composition, the rock and walls recall, in a way, the city’s old spaces and size. It is Aurelio Galfetti, again, who transcends the proposed program creating a simple but ambitious infrastructure for the pools of Bellinzona. Thus, Galfetti uses all the factors involving the commission in order to design a piece of architecture prepared to take on future programs that complement each other. 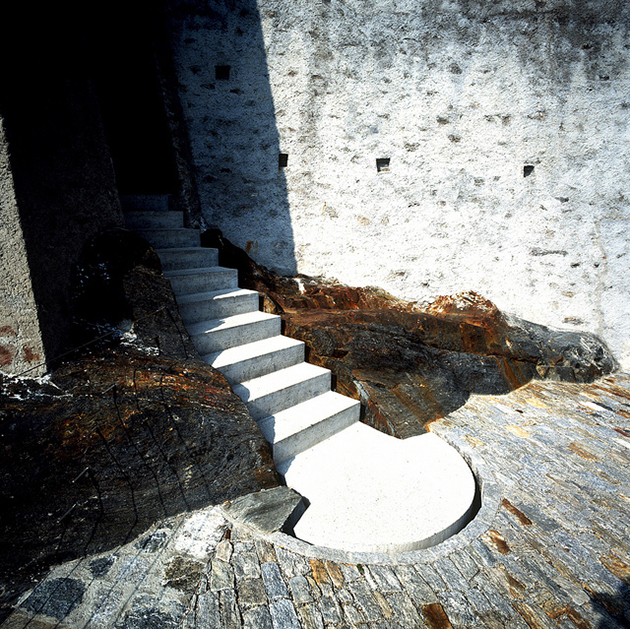 The route of access is embodied in a concrete structure, which organizes the built landscape and territory, through a pedestrian walkway raised 6 feet above the level of the river, connecting visually the empty valley of Ticino, the Castelgrande hill, the city, the mountains and the sky. 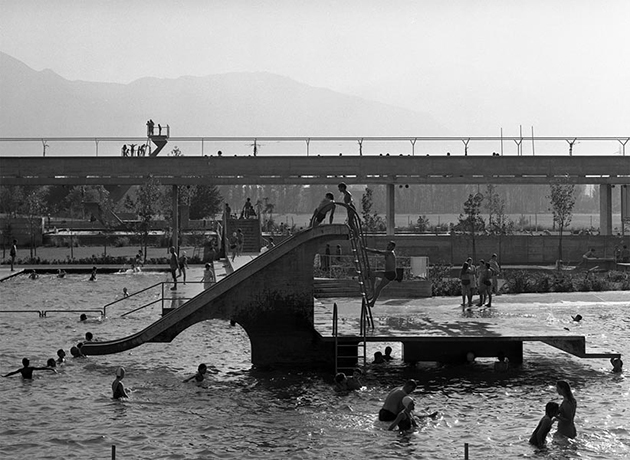 All functional aspects of the pool have been resolved by subordinating them to a spatial vision, meant to merge the city with the river through a pedestrian walkway, a structure that provides the open expansion of a city character, a projected landscape, ready to accommodate new activities and functions.